Appropriate selection of the mouse, despite appearances, is not a simple matter. In the end, each of us has different predispositions, needs, and preferences. Therefore, to make this task easier for you, we have prepared a short guide for you. You will see the division into three categories: comfort, performance and additional functions. These are the most important factors that determine the perfect fit of the mouse. COMFORT - this is undoubtedly the most important issue. In the end, nobody, even on the best-functioning mouse, would like to spend time with her if he felt discomfort due to its use. As in many other areas of life, the mouse should be adapted to us, not the other way around. Just as a skier chooses equipment for his skills and driving style, the player chooses the mouse. Speaking more vividly - choosing too long and too hard skis for beginners, even if we do not discourage it completely, the learning itself will last much longer and will be less effective. Similarly, with the player, too long, the badly profiled mouse will negatively affect the results achieved in games and the overall comfort of work on the computer. The selection begins with determining the grip we hold the mouse. Palm-grip - the whole hand (both fingers and pasterns) rest on the back of the mouse. The mouse "fills" our hand. Only a small part of the metacarpus touches the washer. The movements are carried out with all the hand. It is a catch recognized by many players as the most convenient and works in every game. Provides excellent stabilization and confidence in the movements. The mice for palm-grip are DM1 Pro / S and DM2 Comfy, which provides the highest comfort and relaxation for the hand. Finger-tip - the mouse is controlled by holding only fingers on it. We keep a large part of the metacarpus on the pad. The movements are performed with the wrist and fingers. It is a comfortable grip, but the best control is ensured only with short movements. It allows very fast and frequent movements without causing fatigue. This is the preference for RTS and MOBA players. DM3 mini is the perfect mouse for a fingertip. Claw-grip - the mouse is held with the tips of the fingers with the support of the lower part of the metacarpus. The finger layout resembles a claw (the tips of the fingers are bent to form almost a right angle with the buttons). The movements are done mainly by the wrist. It is a system that provides very high precision with short, fast movements and allows for very fast clicks. In the long run, it can cause fatigue. This grab is especially preferred among FPS players. 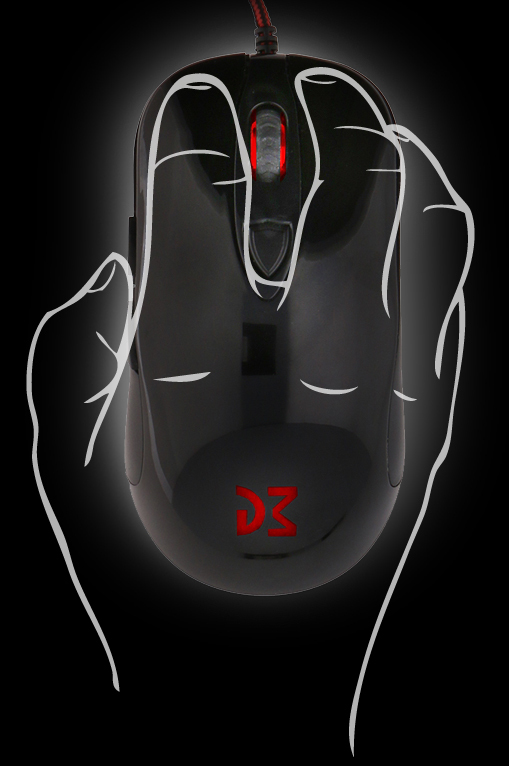 The mouse under the claw grip is DM3 mini and DM1 Pro / S for people with larger hands. Claw + finger - it's nothing but a claw-grip, but in a milder form. The back of the mouse is no longer pressed by the handles, and the fingers form more arc than the claw. Still, only the fingertips touch the surface of the mouse. This grip does not tire your hands as much as a standard claw-grip, and at the same time provides a lot of precision. However, the way of making moves is changing, because it is done here mainly by the fingers. The best mice for such a grip are those of a small size, e.g. DM3 mini. Palm + claw - it is a combination of palm-grip and claw-grip. This is one of the most common games we meet among FPS players. The pattern cover the mouse, and the fingers remain slightly bent, forming a distinctive arch. This combination of grips provides very good stability during movements, allowing a faster click. We make the movements with the whole hand. For this grip, symmetrical, longer mice, eg DM1 Pro / S, are preferred. The grip, however, is not everything, an equally important factor when choosing is the size of our palm >> here after hovering on the text "size of our hand" pops up a picture of a hand and showing how to measure something like here, but without the size of the finger; p http: / /www.test-gear.pl/wp-content/uploads/2013/11/rozmiar-palca.jpg, give someone a photo with a nicer hand, to be well represented: P, I would not give here only a real hand, because then I'd better everything can be seen <<. Individuals with small hands (ie up to ~ 17 cm) can hold smaller mice eg DM3 mini. People with large hands (ie above ~ 20 cm) can use the Comfy DM1 Pro / S or DM2 mice even for a fingertip. In summary, most manufacturers produce mice for people with a hand size ~ 18-19 cm, which is considered universal and it is adapted to any size on the market and allows you to choose it for a given grip. At the moment when our hand is below or goes beyond the universal length, the grip we will use is usually predetermined. The other very important factors affecting comfort are the surface, shape, and profile as well as the sliders. Some rules are assumed that a mouse should fulfill to ensure a maximum level of satisfaction with use, i.e: Surface - it is important that the mouse does not slip in your hand, it is pleasant to touch and provides a strong, firm grip. The shape and profile - elaborate shapes, accessories, decorations that Wit Stwosz himself would not be ashamed of in his sculptures, although they may be pleasing, they do not really have any comfort, they just bother. In short, the mouse looks more simple, subdued, the greater the chance that it is she who will be better in our hands. Sliders - have you seen professional players who use plastic, metal or ceramic sliders in their mice? We also do not. It is not difficult to guess that Teflon is the best and the most effective solution available on the market. It is only important that the sliders are not too thin, they provide a smooth slide and their edges are well rounded. Dream Machines in all of its mice is guided by the above principles, thus providing the best conditions for the game. EFFICIENCY - if we have already taken care of the comfort of use, the next thing to look out for is the performance of our mouse, that is, its technical part. What is commonly referred to as precision is the sensor. It is an element (along with a microcontroller that processes all data and sends it to the computer), which determines the movement of the cursor - its fluidity, speed, accuracy and compatibility with washers. How important it is for the mouse to have the best solution on the market describes a simple example - if you played for example in Counter Strike and want to rotate very quickly, the crosshair went to you where you wanted or drastically slowed it means that you triggered a negative acceleration caused by a faster movement than a given sensor could register (so-called exceeding the maximum speed). This is a phenomenon that no one wants to experience without a doubt. Fortunately, technology has gone so far that we no longer have to worry about such cases. Currently, the best sensor on the market is Pixart PMW3360DM (along with its variations), which can be found only in the top mice of many manufacturers. First of all, it has a maximum speed of 7m / s, which guarantees that you will never trigger negative acceleration while playing. In addition, the cursor movement itself is extremely smooth, accurate, perceptible and very pleasant. It is a sensor that in games can give us a significant advantage. It is not without reason that we have used it in our best DM1 Pro S and DM3 mini models in our Dream Machines mice. We need to be sure that players get the best from us. Excellent parameters, the latest technological solutions, however, have a price that affects the cost of the mouse. For those who do not need the best performance or prefer to choose something cheaper, many manufacturers offer mice with technologically advanced sensors. This does not mean, however, that such sensors are no longer good. Among them, there are a few that can still compete with the top PMW3360. They are PMW3310, S3988, and PMW3325. These sensors are more and more often installed in cheaper devices so that players with "thinner" wallets can enjoy the game at a high level. In our DM1 Pro and DM2 Comfy mice, we install PMW3310, which allows you to keep the mouse price low (compared to the competition) while offering outstanding performance. In addition to the sensor, the switches used under the buttons are very important. Their leading producer is Omron. It is important that the switch is sturdy and at the same time provides a pleasant click of a button. Many opinions suggest that the most popular switches are the DF2C-F-7N (20M) model offering a lifespan of 20 million clicks and guaranteeing crisp, expressive and fast clicks. For this reason, in all our mice we decided to use them. Our switches together with a perfectly designed microcontroller guarantee that the click takes place virtually without delay, which will certainly be appreciated by players demanding network games. ADDITIONAL FUNCTIONS - it is nothing but the ability to configure individual mouse parameters to your liking. The basic parameter, which for nearly all must be configurable to dpi. Currently, almost all manufacturers provide this option by adding a dedicated button to it. What if we would like to change other parameters or configure advanced macros? For this, you will most often need additional software (drivers). In a situation where we do not need macros, as it turns out most players after setting all parameters once, more of the drivers are no longer used. This is of course conditioned by muscle memory, which is also important in FPS and RTS games. Too frequent changes affect her badly, thus worsening our game results. It may also happen that drivers have a bad effect on the mouse or may cause undesirable effects on our computer. For this reason, in all our mice we decided to use them. Our switches together with a perfectly designed microcontroller guarantee that the click takes place virtually without delay, which will certainly be appreciated by players demanding network games.